One of the lucky things about being rich is that you automatically become handsome, your jokes are hilarious, and politicians treat you with fawning deference. On the other hand, the unlucky thing about being poor is that … well, you’re poor. And society generally treats you poorly. Indeed, morally corrupt right-wing officials in Washington and across the country are pushing the idea that poor people must be punished, as if debilitating poverty isn’t punishment enough. From first-grade through senior class, most schools make families pay for their kids’ cafeteria lunch, and a computer program alerts cashiers when a student’s lunch account is unpaid — a shortfall that nearly always involves poverty-level kids. Rather than dealing with this discretely, school systems have taken to publicly humiliating children whom the computer tags as having a meal debt. Some schools literally take an indebted student’s tray of food away, making a show of dumping the lunch in the trash in front of everyone. 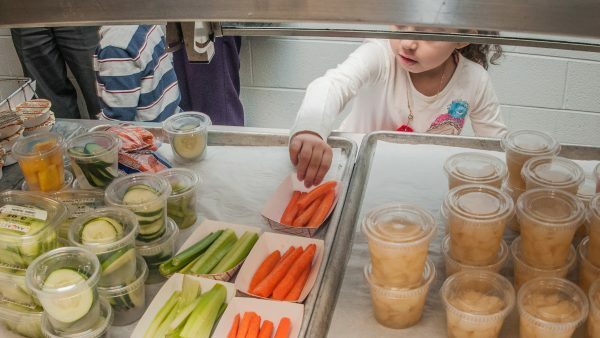 Some remove the hot food from the child’s tray, replacing it with a cold sandwich of white bread and a slice of cheese, claiming that this so-called “sandwich” meets federal nutrition standards. Others actually brand the offenders, as one school in Alabama did last year, using markers to write “I need lunch money” on the poor kids’ arms! The Department of Agriculture reports that nearly half of America’s school districts use some form of shaming and stigmatizing, embarrassing children to tears. What educational lesson is this teaching? And what’s the matter with school boards and lawmakers who are either allowing or directly causing this abuse, using lunch to punish the poor? Being poor means you lack money; being mean to the poor means you lack a soul.